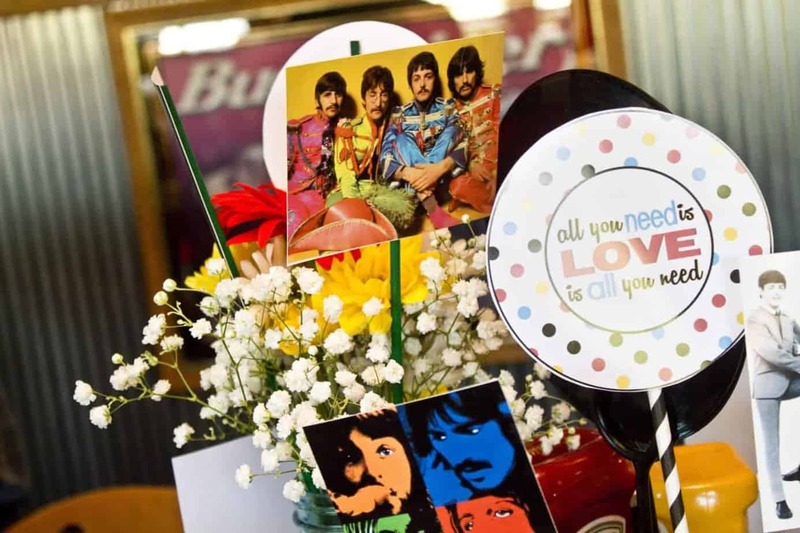 Beatles Wedding: All you need is LOVE Rehearsal Dinner. 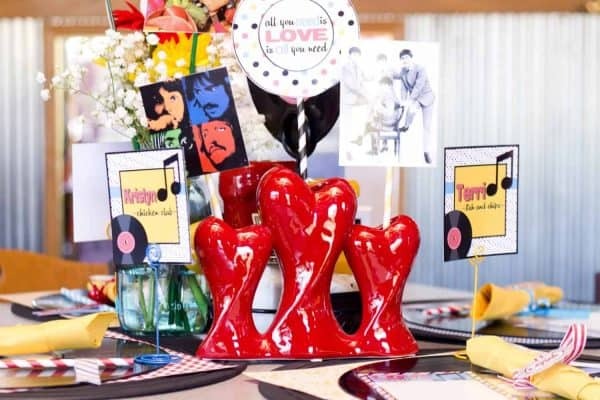 This Beatles Wedding Rehearsal Dinner shows there is nothing quite like Beatles love songs and a little rock and roll twist. 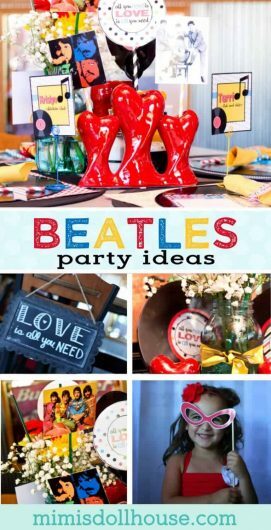 Be sure to check out all our rock and roll party ideas and wedding/bridal ideas. 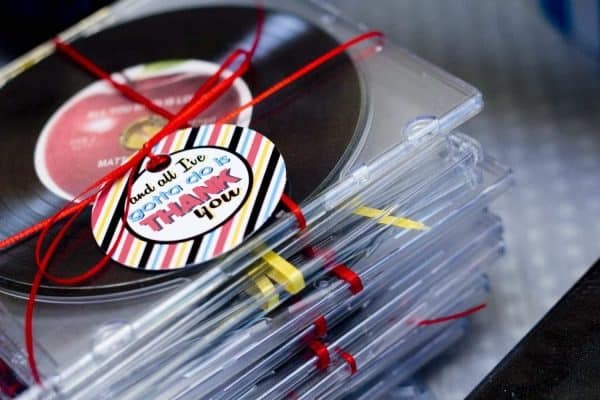 For the decor, I used records with custom labels as placemats. 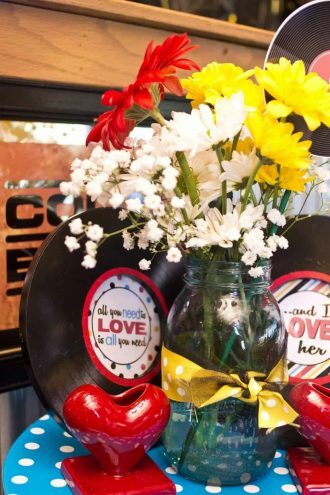 I also had records in centerpieces with fresh flowers, Beatles images and song lyrics in blue mason jars. 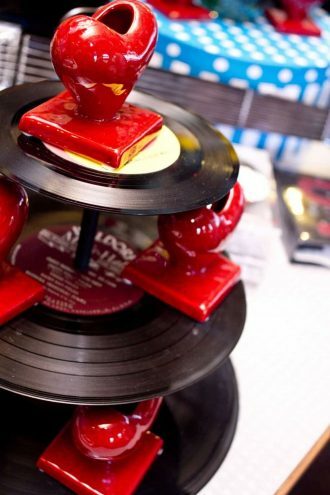 I created a cupcake stand out of records as well. We had cards that said “love notes for the bride and groom” for the guests to write messages to the couple as well. 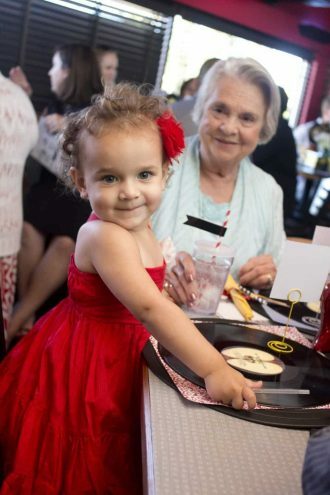 There is my sweet little Emma…she was one cute flower girl!! 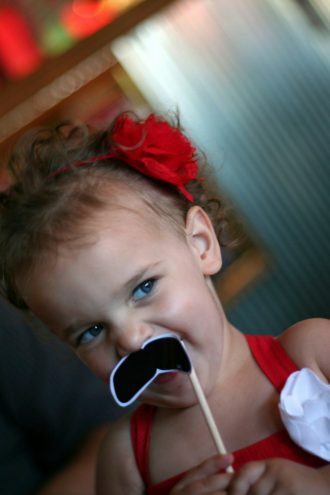 And of course, my girls got a kick out of the photo props!!! She is such a little ham. 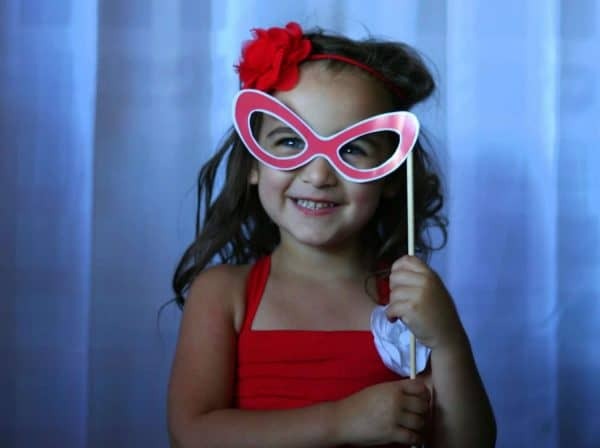 Photo props are so much fun with little kids and they make fantastic photos!! We made this fantastic stand out of old albums. It was the perfect touch! 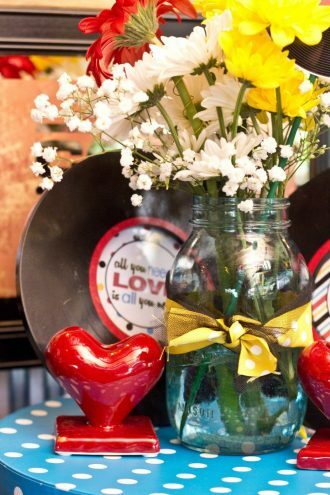 I also scattered pretty red heart vases around the tables as well. 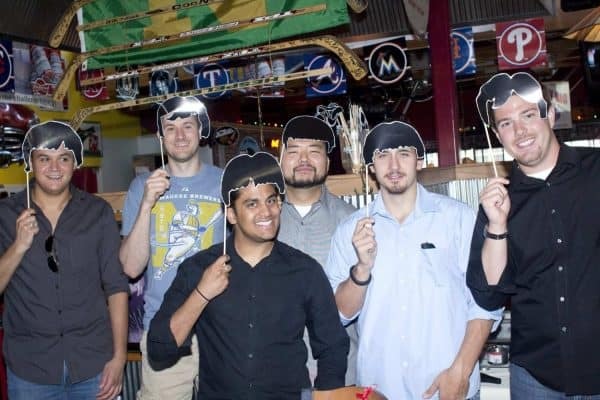 Here are the groomsmen mugging it up for the camera with their Beatles hair-dos! The Rehearsal Dinner was held at an adorable retro sports bar in Marquette, Michigan. 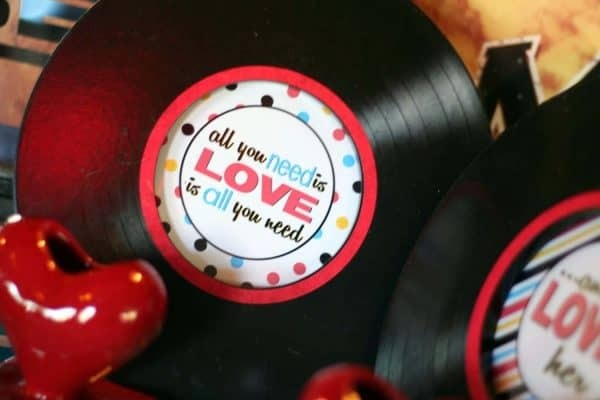 It was absolutely perfect for the retro rock and roll vibe of the party. They served an awesome selection of American bar style cuisine and lots of super yummy milkshakes. How interesting! I love this idea! It is perfect for a wedding reception! Oh I just love this!! I can’t believe you did these decorations as DIY! I’m so impressed! Wow, this turned out so cute! I love the Beatles! 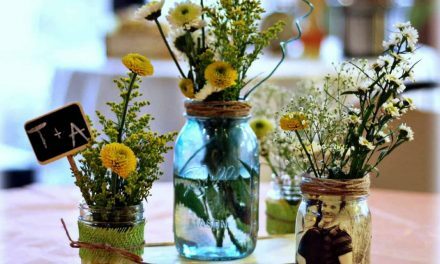 This is such a fun idea for a rehearsal dinner! Who doesn’t love the Beatles?! That is just darling. I think it would be a really fun anniversary party. 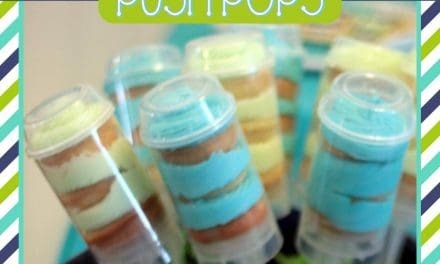 This is so fun, creative, and unique! Love it! I absolutely LOVE this! 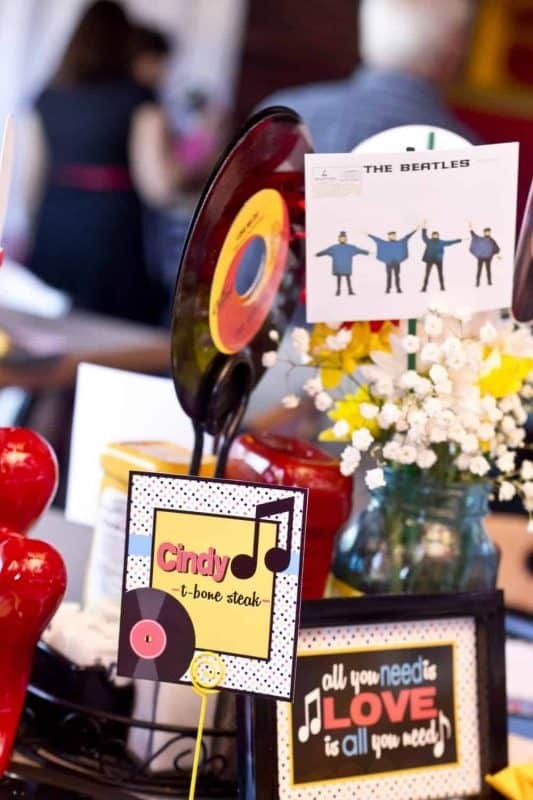 What a cool idea for a rehearsal dinner! I would’ve never thought of that! The art piecesa re so cute and fun. Loved the pictures. I love how bright and colorful this is. 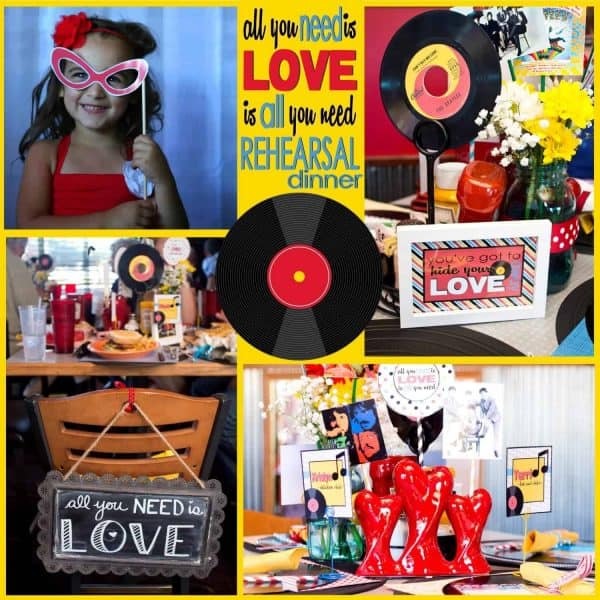 Such a great theme for a rehearsal dinner where everyone can have fun. 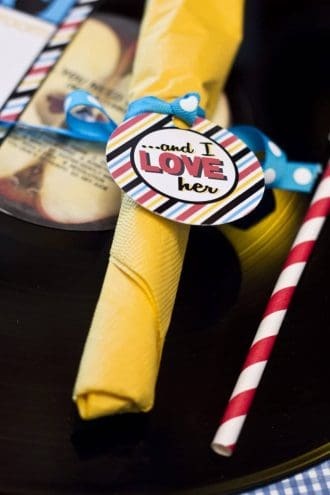 This is such a cute idea for a rehearsal dinner! Although I’ll admit, I don’t know many of the Beatles songs, but I like the theme. We had a Hawaiian themed rehearsal dinner for my wedding. Such a fun party for a wedding. Very unique. What a great theme for the rehearsal! I love the hair masks to hold up! Oh my gosh I love this! What cute decorations and theme! My father and my sister loves the beatles. You really have some lovely pictures. A very creative and unique way to celebrate a wedding. This is the cutest wedding idea!! How creative of you. I love the retro vibes and all the bright cheery colors. Everyone seems so happy!! How can it be possible to have such a lovely wedding like that?! 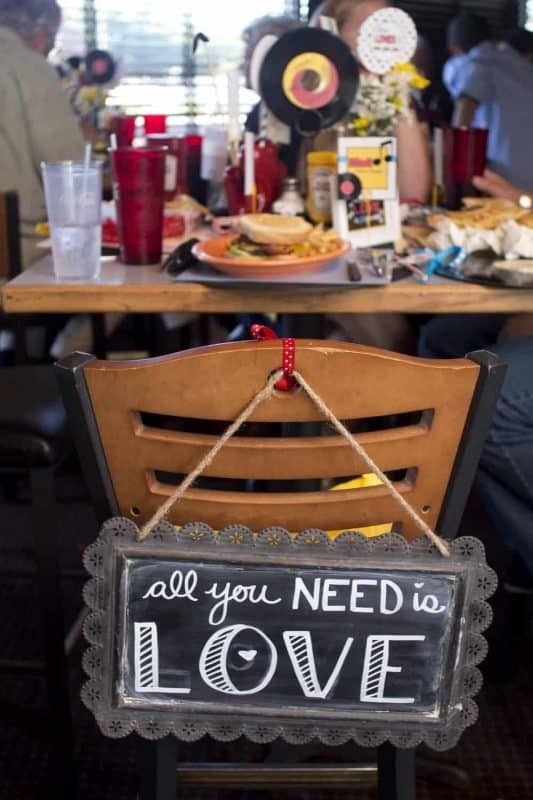 It is such a great idea for some couples who haven’t decided which food will be served for the guess! Thanks for sharing! 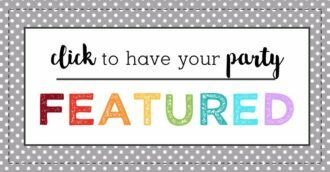 I’m loving this theme and all the party decor! The beatle hair-do sticks are too funny. 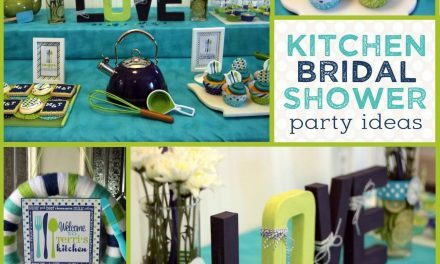 This is such a great idea for a party! I love when things are personalized. You did an awesome job on the decor. This is such a really fun idea. I never really would have thought of this as a theme but it is FANTASTIC! My favorite part is the mini flower arrangements. Gerber daisies are the best.